I am no longer capable of imagining a world without guindillas. Fresh, they appear each spring on the counters of pintxo bars, in bowls that signal their availability. Sometimes, but not often, accompanied by a hand-written or Microsoft Word sign that says "hay guindillas". 1 out of 10 fresh guindillas are spicy, and if I had a nickel for every theory on which are the spicy ones, I'd have, like, $1. The big ones. The small ones. The skinny ones. The only thing I've found to be remotely fact-based is the ratio of spicy to non-spicy changes as the season stretches on. 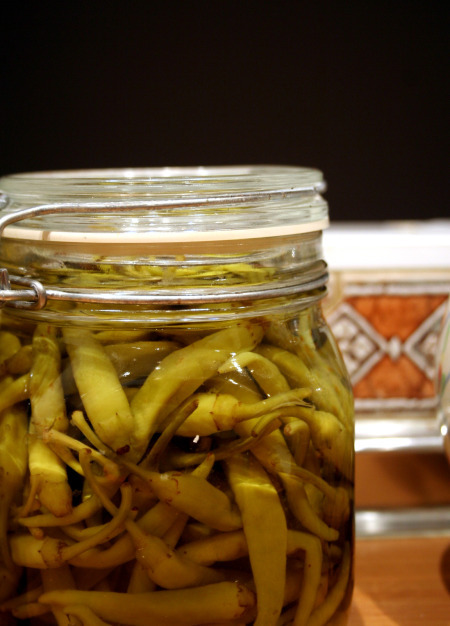 The rest of the year, there's pickled guindillas. These are ubiquituous, as one of the main ingredients on a famous pintxo, on a notorious mini-sandwich of tuna, anchovy and pepper, and all the way to the new posh eateries in town that serve it in a mayonnaise on some farm-raised hoity-toity hamburger. Plus they're just amazing popped into your mouth around 7pm with a glass of red vermouth. Blanch guindillas for one minute in boiling water. Meanwhile, in another pot, boil a mixture of 60% vinegar and 40% water with two bay leaves for 10 minutes. Place peppers in jars, covering them with the vinegar water mixture, and throw in a large pinch of salt. It's not necessary but I usually put the jars lid down while they cool. Allow them to pickle for about a month for best flavor.